(New Britain, Conn., March 18, 2016) – New Britain team officials today announced that the club has signed outfielder Greg Golson for the 2016 inaugural season. 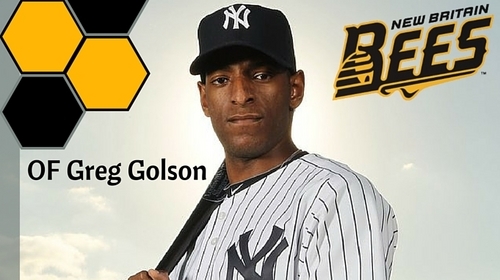 Golson becomes the first member of the Bees’ roster with previous MLB experience, having spent parts of four seasons with the Philadelphia Phillies, Texas Rangers, and New York Yankees. A native of Austin, Texas, Golson was drafted in the first round (21st overall) by Philadelphia in the 2004 MLB Amateur Draft. Known for his speed, Golson stole over 200 bases during his 10 year MiLB career. The 30-year old also has Atlantic League experience with the Lancaster Barnstormers in 2013 and 2014, batting .312 with 20 RBIs in 51 games during the 2014 campaign. Most recently, the right handed hitting Golson played in Mexico, posting a .320 batting average with 53 RBIs and 25 stolen bases in 102 games with three different clubs. The 6-foot, 190 lbs. outfielder has experience at all three outfield positions, primarily playing right field during his Major League tenure. Bees’ individual tickets will go on sale this Saturday, March 19th at 10 AM exclusively at New Britain Stadium and will be available online the following day (March 20th) at 10 AM. New Britain’s mascot will also be unveiled at the event. The Atlantic League is the most innovative league in professional baseball and a gateway to Major League Baseball. In the league’s 18-year history, over 34 million fans have attended ALPB games and more than 800 players have joined MLB organizations. The Atlantic League emphasizes winning baseball games, showcases the talent of top-caliber players and offers affordable family entertainment to metropolitan markets serving nearly 15% of the US population. ALPB clubs serve the communities of Bridgeport and New Britain, Conn., Lancaster and York, Pa., Central Islip, N.Y., Bridgewater, N.J., Waldorf, Md., and Sugar Land, Texas.